The purpose of Aging is to increase the power of your equipment by using it skillfully. Aging was recreated by a Morion elder, Morif, who obtained the knowledge of aging via the art of the ancients. By combining animated energy from Sheltoms to your equipment, it enables the power of the equipment to grow. Only armors, robes, weapons, shields and focuses can be Aged and its effectiveness applies differently for each item. In order to age equipment, you need to have the equipment you want to age on hand and the required sheltoms. Here is a table showing what sheltom is needed for each level. There is a possibility to lose your sheltoms, money and the item level may decrease -1 or -2 grade. There is a possibility to lose your sheltoms, money and item. The item level may decrease -1 or -2 grade. To begin the Aging process, you first need to go to Pillai Town and visit Morif. If you pay the aging cost and required sheltoms, the Morif will try to age your equipment. By repeating this process, you can age an item up to 18 times per item. But, it depends on the artisan, after your 4rd aging, there is a chance that it may fail. When it fails, you will lose your sheltoms, money, and item. 1. Once you put the equipment to age in the window, you can see the required cost and sheltoms.Put your sheltoms into place and press + to begin. 2. When you have succeeded the initial Aging process, you will see a bar graph and an aging grade of +0 on the item's stat box. Now to mature it! 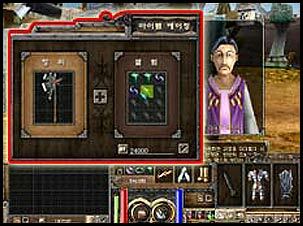 Once you succeeded in Aging, you will see a progress bar on the item's stat box. 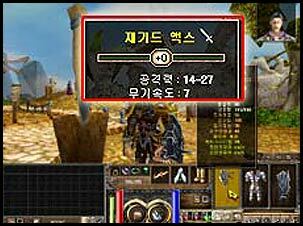 After the maturation is done, the aged item will be completed and its level will be shown on the item screen. Requirement level for designated items increases by one level when aging level increases by 2 levels. Therefore, players should try to use aging tools appropriately for each character level. Note: Durability of aging equipments decreases as shown in the chart below.